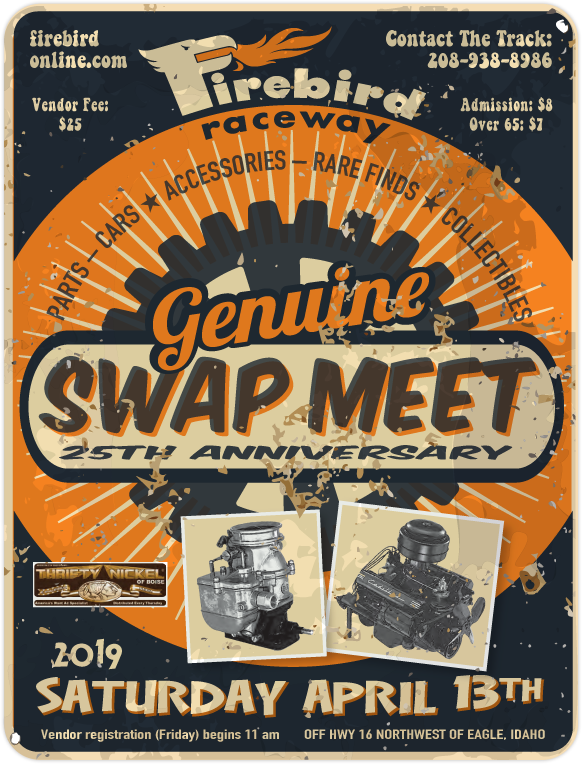 The 25th Annual Spring Warm Up & Swap Meet presented by Thrifty Nickel returns to Firebird on Saturday, April 13, 2019. The event has become the largest automotive swap in the five-state Intermountain region. Vendor space is available on a first arrival basis (day of the event). 10′ x 20′ spots run $25. No advance registration is offered. Pay for your spot when you arrive at the raceway. You will also be required to fill out a ST-124 Idaho State Sales Tax form at the gates when you check in. After paying for your spot, space is designated by the parking team in the pit area. Hundreds of vendors and virtually thousands of buyers and fans attend the opening Swap Meet of the season, in addition to a full day of test `n tune and grudge action. Vendor space is assigned at time of arrival in 10′ x 20′ spots. No advance is registration.